Each week in February, I’m celebrating the release of my new book Words to Dream On with a giveaway! The winner of last week’s prize is Joyce Maynard. Congratulations! THIS WEEK’S GIVEAWAY: An autographed copy of Words to Dream On plus Hidden in My Heart: a Lullaby Journey through Scripture CD. The giveaway begins now and ends Saturday, February 28, at 11:59 PM Eastern Standard Time. Winner must live within the continental United States. To enter the giveaway, just leave “I’d love to win” as a comment below OR join my quarterly newsletter list (use the box at the left). Winner will be announced in my post on Monday, March 2. Children have an amazing capacity for memorizing. Just ask one to sing you a song from Frozen or the latest TV jingle! Those words “hidden in their hearts” will lodge there for a lifetime. Why shouldn’t we make sure, then, that God’s Word gets placement in those little hearts and minds too? Here are five ways to make memorizing Scripture effective and fun (at any age–you might want to try these out yourself!). Repetition is key, but it doesn’t have to be boring! 1. Put the words to a beat and chant them together. Add claps, taps, and foot-stomping if you’d like. 2. Sing the words. Make up your own tunes, or try some of the excellent Scripture songs available from children’s artists. Try music from Yancy, Steve Green, the Seed Company, Twin Sisters, and others. 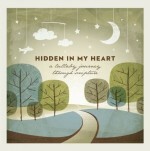 The Scripture Lullabies series from Hidden in My Heart is great to play as children drift off to sleep, and I’m including Vol. 1 as part of this week’s giveaway! 3. 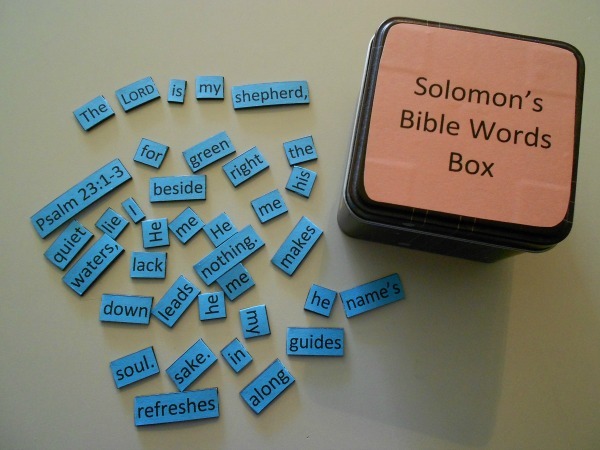 Make reading and repeating the verses aloud together a family activity. This is one strength of the Charlotte Mason Scripture memory system. 4. Make verses visible. Post them around the house where children will see them often. 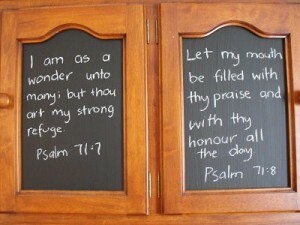 Write a different verse each week on a chalkboard in the kitchen. Let children copy a verse themselves and choose where to post it. 5. Make verses tactile. 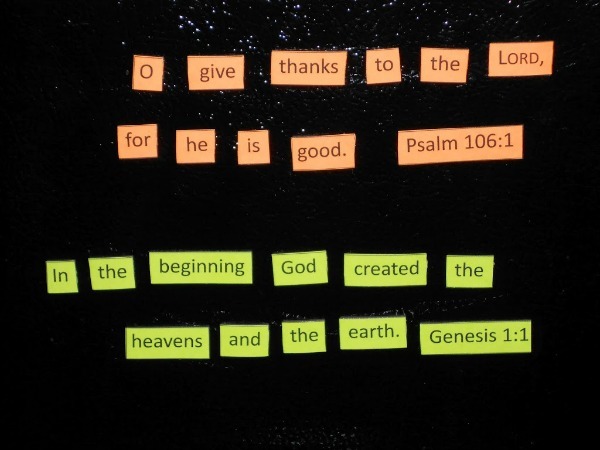 My grandson has enjoyed verses I made magnetic for him to assemble and stick on the dishwasher, fridge, or a cookie sheet. Just print out the words in large type on colored paper with extra spaces between each word. Then back the verse with magnetic strips and cut the words apart. Printing different verses on different colors helps children sort and assemble the verses too. Which memory method will you try soon? Don’t forget to enter this week’s giveaway! Just leave “I’d love to win” as a comment below, or join my newsletter list. He’s Been Reading to His Kids at Bedtime for 22 Years!